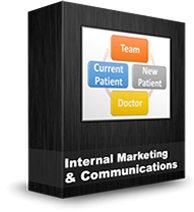 Dental marketing is more than just a geo-targeted, search engine optimized dental website and an effective email newsletter marketing plan. It also involves branding and an effective dental office display, which should begin before patients step inside your waiting room. Great dental office signage offers you the ability to speak to those potential patients when your practice is closed. The Wealthy Dentist went on a search for a dental practice that exemplifies great dental office display — one that effectively markets new patients on its own. 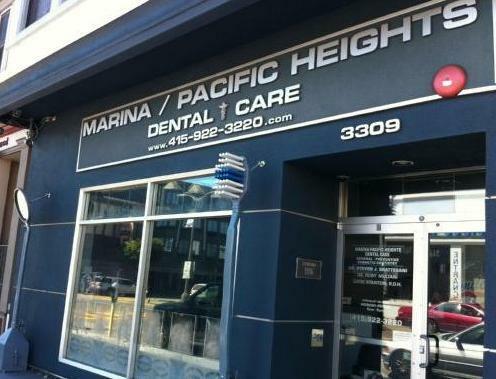 We found a perfect example in San Francisco at Marina Pacific Heights Dental Care. 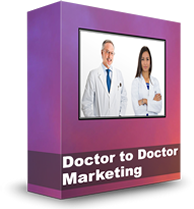 This dental practice maximizes every opportunity to reinforce their brand so patients have no doubt what this dentist offers. 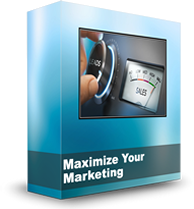 They also get their dental marketing right from the start with their geo-targeted dental practice name: Marina Pacific Heights Dental Care. There are over one hundred neighborhoods in San Francisco, with the Marina and Pacific Heights neighborhoods being two of the most well-known. 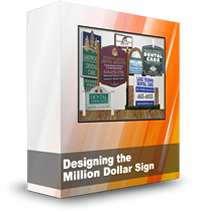 Are you curious how this dental office signage is considered a hot marketing machine that (very) effectively attracts new patients? 1. 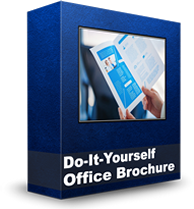 Effective outdoor marketing starts with the appearance of the office front. 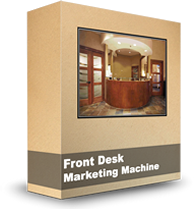 The front of your dental practice is the first impression a client may have of your business. It is important to portray an appearance of professionalism with fresh paint, clean windows and an entrance that is inviting to a new patient. In this case, Marina Pacific Heights Dental Care chose marine blue as the color to their building front to most likely match the Marina branding, plus the color blue is often associated with depth and stability. The large, bright windows give the practice a welcoming feeling, thus inviting dental patients to walk up and take a peek inside. When deciding on a dental office sign, it’s important to consider optimal letter size, fonts that are easy to see along with plenty of negative space for readability at various distances. These considerations help make sure that passers-by can read your message. Notice how big, how bright and how tastefully done the Marina Pacific Heights Dental Care sign is. It provides high visibility on what appears to be a heavily trafficked street in San Francisco. 3. 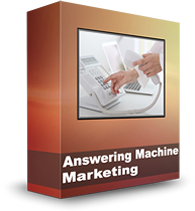 The use of the office phone number in branding. Not only is Marina Pacific Heights Dental Care phone number easy to read for drive-by traffic, but it also is cleverly used as a web address. If you visit www.415-922-3220.com, it automatically redirects you to their actual site: www.drbrattesani.com. Dr. Brattesani takes advantage of not only his name in his marketing efforts, but also his office phone number. As a dentist you need to make it very clear what your dental practice offers. 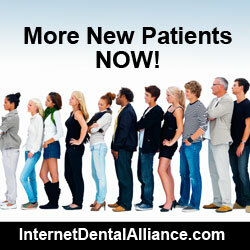 Dental treatment advertising can enhance your appeal while prospecting for patients. In Dr. Brattesani’s case, he utilizes his windows to tell patients what dental treatments his practice offers, along with images of happy, smiling patients. It also demonstrates that while he does “Cosmetic Dentistry” he does not limit his practice. The front door of your dental practice should clearly display crucial information for dental patients, delivery people and street traffic. It should display important information such as your practice doctors, operating hours, contact details and dental treatments. Marina Pacific Dental does this effectively on their door which is clearly visible to people as they walk down the street. Take special note of the “Big Smiling Lips” and the inclusion of the Hygienist’s name on the door – classy touch. 6. The use of key visuals with pop-art sculpture. Humans remember key visual images better than they remember words. Effective dental visuals can capture attention instantly, and communicate what your business does quickly. This dental practice captures immediate attention with their toothbrush and mouth mirror sculptures. There is no question to passers-by that a dental practice occupies this location. These pop-art sculptures could be especially effective in San Francisco where people might be tempted to stop and have their photos taken next to one of these eye-catching icons, then post it on Facebook, or other social networking sites for their friends to see. Plus the scupture send the message that this dentist office is fun. Adding something special to your entrance way with a custom welcome mat, engraved tiles or painted pavement can do wonders for inviting your patients into your practice before they open your front door. An attractive entrance adds to the ambiance of your building, both by the way it looks and by the impression it gives to street traffic and patients. 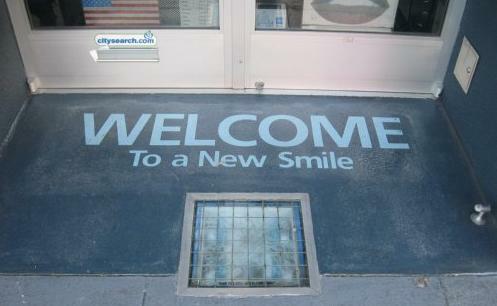 Dr. Brattesani does this effectively by literally painting the street the same marine blue color and creating a “Welcome to a new smile” floor mat at the entry to their practice. All in all, The Wealthy Dentist gives Marina Pacific Heights Dental Care high marks for turning their dentist office front into a hot marketing machine. 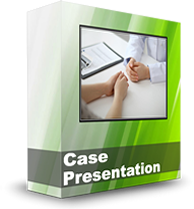 It is important to leave a lasting impression in the minds of your patients. The more your people who know your name, where you are located and what treatments you have to offer, the better patient-ambassadors they can be. It all starts right at your front door. Dentists: Does 99 Dollars an Hour Make You a Wealthy Dentist? Dentists make $99.00 an hour, which is more than orthopaedic surgeons but less than nurse anesthetists, according to a study by Suneel B. Bhat, MD, an orthopaedic surgery resident and his colleagues at the Thomas Jefferson University Hospital. Presented this month at the American Academy of Orthopaedic Surgeons (AAOS) 2012 Annual Meeting, Dr. Bhat’s study found that becoming an orthopaedic surgeon was a “poor financial investment” compared with studying law, dentistry, or anesthesia nursing, according to Medscape Today News. “Our study, the first direct comparison of the financial return of orthopaedic surgery to other professions, highlights the point that there is a relatively lower financial value incentive for qualified individuals to enter orthopaedics compared to several other professions, which could potentially have far-reaching implications on career choice and subsequent access to care for patients,” the authors concluded. 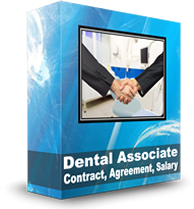 The Medscape report revealed that the researchers found that dentists earned a cumulative career total of $6,866,796. That was less than the $10,756,190 made by orthopaedic surgeons, the $8,381,250 made by lawyers, and the $7,338,412 made by nurse anesthetists, but more than the $3,867,504 made by nurse practitioners. Also published in the report is the amount of debt factored into the study for orthopaedic surgery students, which has increased by $34,000 for public schools and $40,000 in private schools over the past five years. Since 1984, the medical school tuition has raised in public institutions by 165% and in private institutions 312%. They assumed that educational loans would be deferred until the annual liability was less than 25% of earnings, and that interest on the loans was 8.25%, according to Medscape. When hourly income was calculated, orthopaedic surgeons made $88.00 per hour, compared to $93.00 for nurse anesthetists, $130.00 for lawyers, $49.00 nurse practitioners, and $99.00 for dentists. The lingering recession has taken a bite out of dentists’ incomes over the past 4 years with many laying off employees and postponing retirement. The average dentist salary according to the U.S. Government Bureau of Labor Statistics is $74.00 an hour, with some new dentists earning $26.00 per hour at the lower salary range, while dentists at the upper range earn $80.00 per hour. Another recent study compared the earning of high school graduates who skipped college and grad school expenses and went directly into the trades. The study compared a plumber with no advance educational cost and debt to a physician. The plumber came out ahead on life time earnings. The real kicker was that the physicians not only got nailed for the extra school costs and debt expense, but were taxed by the government at a higher rate on their delayed earnings. With the cost of higher education continuing to rise and the amount of student loan debt graduates carry after graduation, do you think dentists leaving dental school today still have the opportunity to become a wealthy dentist? The business of charging taxpayers for putting braces on kids’ teeth has exploded in Texas over the last three years according to a story by WFAA-TV in Dallas. In 2010, Texas spent $184 million on Medicaid orthodontics — more than the rest of the United States combined. I want you to understand, right up front, that I’m tremendous proponent of just about any program that put dollars in dentist’s pocket for providing quality dental care. Time to be honest, this level of government pork could only have been arranged in a smoked filled back room in the dead of night. While Texas struggles with its Medicaid budget, 34 dental organizations collected more than $1 million in Medicaid orthodontics last year. Orthodontic treatment for children is generally an elective cosmetic procedure that many parents spend thousands of dollars on for their children. 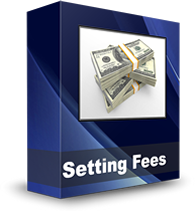 Very few dental insurance carriers cover orthodontics or elective procedures such as teeth whitening. But in Texas, Medicaid pays dentists for orthodontics per procedure, instead of a lump sum for the “finished mouth” of straight teeth, according to WFAA-TV. This has made Medicaid orthodontia a lucrative dental business in Texas. So much so that just three years ago, dentist Richard Malouf’s All Smiles Dental Centers of Texas collected $5.4 million from Medicaid orthodontics. Since that time, All Smiles’ Medicaid orthodontics billings nearly doubled to $10.2 million. This caught the interest of Chicago-based hedge fund Equity Partners who recently acquired All Smiles Dental for an undisclosed sum. Now Texas dental clinics are being bought up by hedge funds, making Wall Street the ultimate destination for millions of taxpayer dollars as reported by WFAA. Nowhere is the lucrative business of Medicaid braces more evident than with dentist Richard Malouf’s mansion in Dallas. It is a massive French chateau with a pool house, big enough for the average American family of four to live in. The Maloufs also own the mansion next door. 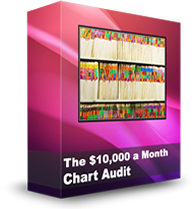 According to tax records the combined value of the two properties is more than $14 million. It is known as the house that braces built. Dr. Malouf isn’t alone in offering Medicaid braces; there are five other dentists’ offices that provide Medicaid orthodontia on the same half-mile street in Dallas. Many of them advertise free braces under Medicaid. Jefferson Dental is one such dental operation and, according to WFAA, it is owned by hedge fund Black Canyon Capital of California. During a struggling economy, many question whether this is the best use of taxpayer dollars. A Medicaid dollar that is spent on braces is a Medicaid dollar not being spent on fighting cavities and procedures most dentists feel are necessary. It will be interesting to see how this story unfolds. I really want to see the which legislators initiated and signed off on this this piece of legislation and who the lobbyist where who pushed it through. I not sure other state dental boards should hire them or hang them?